I bought a bag of these peppers recently and they were pretty darn good. I sprouted some seeds and they are up, just wondering if anyone has tried growing these from store bought peppers? I haven't from store bought, but do have red, orange, and chocolate mini bells in party cups. Are mini bells the same as cheese peppers? I am not sure, so I'm growing both. I bought a bag of those sweet minis from the grocery store. Saved seed, but haven't grown any of it out. Personally, I didn't think they were sweet at all. My bag had a sort of hot weird taste. I could be wrong, but I say no they are not the same. The cheese peppers which I growing this season are small more round and squaty, like somebody sat on a regular bell. The cheese ones I am growing to make my favorite spice this year. Paprika. The gang here has put together an excellent tutorial and shown pics if your interested. no they are not the same. mini bells are about 2" in diameter at most and look exactly like bell peppers. cheese peppers are much larger closer to 4" or a tiny bit more maybe, depending on their growing conditions. And that bag of peppers looks exactly like the "Yummy" variety of all the colors.... not the yum yum mix, but truly "Yummy" ( a variety out of Hungary)... which in the past several years they have started marketing them as hybrid peppers and they are not. they have such small seed cavities that I think (IMHO) that they are selling them as hybrids because hybrid pepper seeds are much more expensive than OP seeds.. and in order to make up the difference in seed harvest they can sell them at a higher cost to the consumer. Last edited by clkeiper; March 19, 2017 at 08:53 PM. Most supermarket peppers are hybrid of some sort or the other ... I don't bother seed saving those. Peppers take too long to grow, only for disappointment at harvest time. I'm growing 3 colors of cheese peppers this year, curious on what to expect... mini bells looked similar. 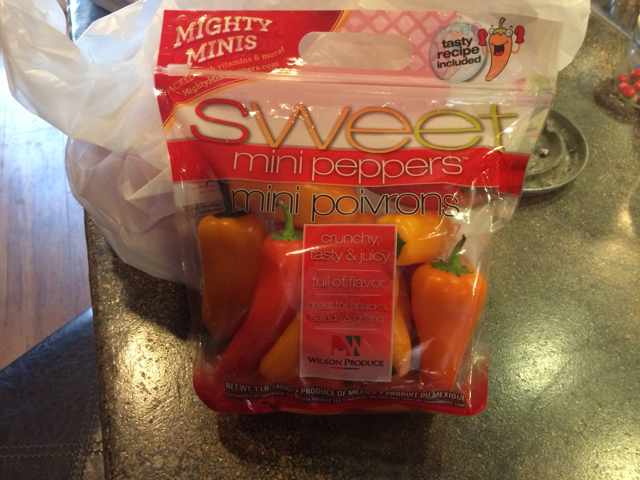 These Mighty Mini peppers aren't bells, more like a gypsy pepper only smaller and in different colors. I am growing 2 colors from those store bought : Yellow / orange and red. Not knowing if they are hybrid or OP, don't know what to expect. They both were fast germinating and I've got 3 or 4 of each. The plants are as healthy as they could be. But I figure they will be sweet peppers doesn't matter what shape or size. They are great on the grill. I am growing Orange and Red Cheese peppers. That's what the packs said as their name. Last edited by AlittleSalt; March 19, 2017 at 09:44 PM. I think they all eventually turn red , given time. So yellow/orange are intermediate colors like Cascabella. I have grown cascabella before. But there were much smaller in size and had heat. It was very productive. 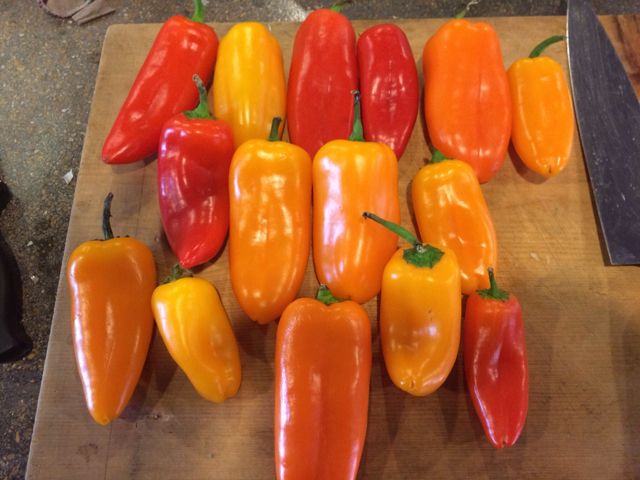 Cheese peppers are a larger type of sweet pimento pepper, a distinctly different pepper than a bell. You will see they have intense sweet pepper flavour and thicker walls than bells. Very crisp and juicy. My fav pepper to grow for fresh. Just fantastic. Not all cheese peppers have the word cheese in their name. There are lots of varieties and IMO should be grown more often. Try one called sweet apple if you can get seeds. Enjoy them, interested to see what you think and the. Orange, yellow and red cheese peppers of those names ripen green to yellow or orange or red, not a progression of colour. Like all sweet peppers they can be eaten green but the real treat is the sweet crunchiness of the fully ripe ones. smallush plants and easy to grow in pots. Last edited by KarenO; March 20, 2017 at 03:58 AM. I'm growing the store bought mini peppers too. From everything I've read, they grow true most of the time. We'll see. I had a heck of a time getting them to germinate, kept getting stuck in their seed coats, finally germinated them on a paper towel and planted them when they sprouted little roots. ALL of those came up perfectly, so now I have lots of little plants. I grew 4 of them several years ago and they produced very well and the peppers were just like the packaged ones. Are these the same or similar to Lunch Box pepers?